Singer, actress, songwriter and all-around pop icon Miley Cyrus has been topping headlines for more than a decade now. Not only is she famed for her talent, but also for her daring (sometimes even outrageous) style. For the past several years, she has transitioned from innocent Disney star to eccentric Hollywood superstar and back again, all with different hairstyles for each stage. 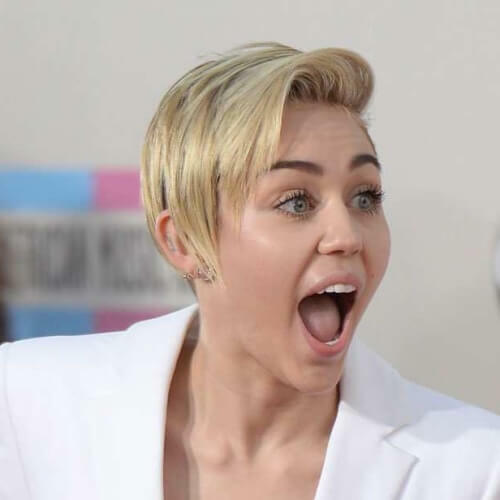 Discover her looks throughout the years and see which Miley Cyrus haircut is for you! The current Miley Cyrus haircut that everyone is searching for is her spicy pixie cut. We’ll be presenting a number of variations for this playful hairstyle, but here’s one of Miley’s well-rounded pixie’s that you can copy for any occasion. 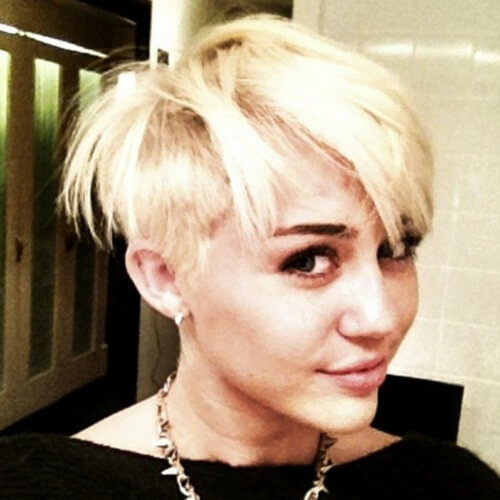 For a more daring approach, you can add an undercut to your Miley pixie. 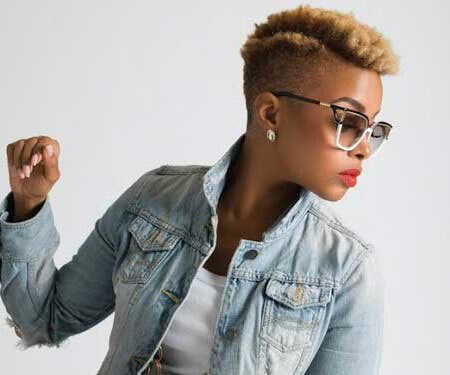 We’re happy to see that more and more women are stepping out of their comfort zone and experimenting with razor pixie cuts. In the end, you have every reason to try this daring hairstyle out. Back in her Hannah Montana days, Miley could always be seen with incredibly long, flowing hair, decorated with soft layers. We believe the look suits her just as well as her platinum pixie, so you should think about testing it for you as well. There’s something about flippy hairstyles that has both gals and guys swooning. If you’re into pixie haircuts with longer bangs, a flippy style like Miley’s in the photo above will have you weak at the knees. It’s fun, classy, and cute at the same time. When she rocks an undercut, Miley looks absolutely amazing from any angle. 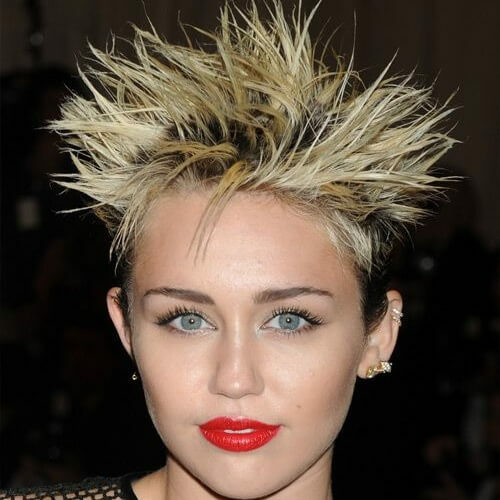 If you’re considering this type of Miley Cyrus haircut, we recommend going for a 360-degree undercut with a long top. Style the upper portion at your leisure. Medium-length haircuts, both blunt and choppy, are all the rage this year. Any shoulder-length hairstyle will be as trendy as possible, especially if you pair yours with a nice coloring job. Go for ombre or balayage with natural shades. Time and time again, Miley proves to us that super short haircuts don’t result in a lack of styling options. If you’re looking for a chic hairstyle to flatter your short locks, try slicking them down. You’ll be red carpet ready in no time. 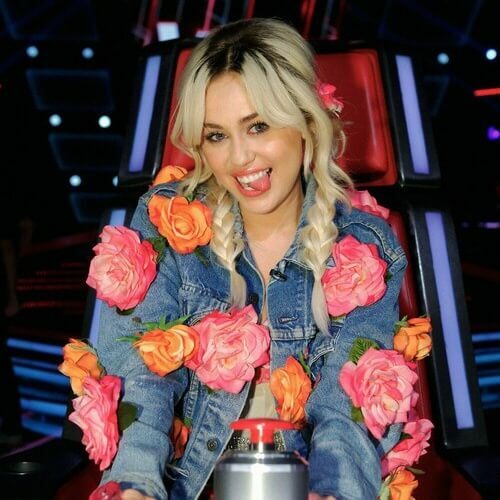 When she sports long hair, Miley can almost always be found with wavy locks or big, loose curls. All the same, she looks outstanding with her long hair straightened too. The pic above will certainly serve as inspiration for girls that want extremely long, paper-straight hair. Retro hairstyles will always give off a strong sense of femininity. 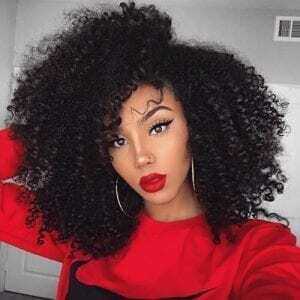 Regardless of your hair length, you can go for the big and loose curls look we were talking about earlier. For an extra vintage touch, part your hair to the side and tuck a few strands behind your ear on the opposing side. We’re thrilled to see that shadow roots are dominating the hair trend charts. Not only are they an eye-catching way to blend colors, but they’ll also help you get a natural glow for your hairstyle. Either get the roots darkened professionally or let your hair grow out after dyeing it. In the past several years, Miley has never been a stranger to playing around with boyish haircuts. Her crew cut, for instance, is easily a hairstyle that you’d see on plenty of guys these days. However, she proves that you can rock any short haircut with some girly glam. Even though contourage highlights are one of the latest hair coloring trends, Miley had been sporting them ahead of their time. The global trendsetter shows how a long bob can come to life beautifully with blonde highlights on the strands that frame your face. We have yet another cute idea for women that are searching for long-haired Miley Cyrus haircut inspiration. Instead of hitting the scissors to reduce length, make the most of it with a sweet, half up, half down halo braid hairstyle. Do you feel like you were born to be a rockstar? Show it through your haircut! A pixie cut or short bob can be easily styled into a cool faux hawk. You don’t even have to shave the sides for this look; it’s all in the way you slick the rest of your hair down. If you’re on the hunt for a practical and stylish haircut, the blunt long bob will be a dream come true for you. The hairstyle works like a charm for women with any face shape, especially if they have naturally straight hair. A highlights and lowlights mix will always do an excellent job of brightening any hairstyle. In Miley’s case, the blend also accentuates her wavy hair, outlining individual strands. We recommend it for a summer look with a sun-kissed glow. You’d be surprised to find out just how big of a comeback the bowl cut is experiencing this year. Nevertheless, we do want to point out that the modern, messy version is trending at the moment. To get one, work your way into a short bob with a circular silhouette. We also have another vintage Miley Cyrus haircut that we’re sure you’ll adore. If you’re not willing to cut your hair, you can go for her Jessica Rabbit-inspired look with long, loose waves. Push them to the back for even more style. Two tone hair is a fabulous way to stand out through your appearance. 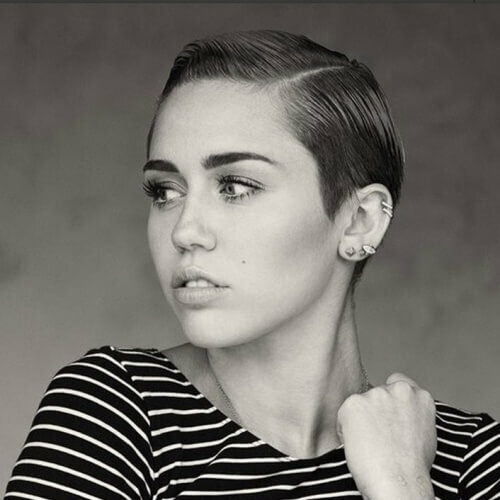 In Miley’s case, it’s all about working around an undercut foundation. As a result, she bleaches her top and leaving the undercut portion her natural hair color. So, shadow roots are one thing, but what about fully grown out hair? It’s definitely one of the recent trends that women will go crazy about. With such a natural, careless, and youthful edge, what’s not to love about it? The high ponytail is one of those hairstyles that you can adapt to any setting. For example, you can rock one with a sophisticated evening gown for a formal event. On the other hand, it works just as well for casual occasions. Make the most of the hairstyle if you have long locks. Are you a girl with summer forever in her heart? Well, that means that the beach waves look is undoubtedly for you. Once you have your long bob in place, you can use some mousse or hair cream to get natural-looking beach waves throughout your hair. In her eccentric days, Miley never ceased to shock the media with her outrageous hairstyles and outfits. If you’re a punk girl, we’re sure that you’ll fall in love with her super spiky haircut here. Bring on the strong-hold hairspray! Still, that doesn’t mean that Miley can’t look like a textbook lady when the situation requires. For fancy occasions, we recommend trying out an elegant updo like her hairstyle in the above photo. It will be a piece of cake if you have medium to long hair. Are you getting tired of having your bangs in your face all the time? The ideal solution for pixie girls is to simply rake all of their back and away from their forehead. The hairstyle is cool and useful without losing a feminine touch. Channeling her inner Adele, Miley blew us away with her retro, bouffant hairstyle appearances. We’re all well aware that trends are cyclic, so don’t be afraid to try out looks that were hot in the 70s or 80s. You just might end up becoming a trendsetter yourself. Perhaps some of the cutest pixie cuts of all are with side-swept bangs. We particularly recommend the approach for girls who parted their hair the side prior to getting it cut. The transition from long to short hair will also be easier this way. Long gone are the days when pompadours were reserved only for male hairstyles. Thankfully, women can now show off courageous pompadours that flatter short and playful locks. As you can expect, hairspray in abundance will be required for the look. If you’re planning on maintaining long hair, you’ll see that it will become a genuine nuisance if it’s left down all the time. To feel comfortable while also switching your look around, we suggest tying your long strands into a cozy, low ponytail. Another wonderful hairstyle for women with short hair is the quiff. Like with the pompadour, it usually was highly popular among men’s hairstyles. Now, though, it’s a must-try for all women that sport shorter locks. It’s amazing what a casual side braid can do to a girl’s appearance. Provided your hair is long enough, you can set it all to the side and use your favorite braiding technique for the styling part. It also helps if you have a layered haircut. We have always admired the Wrecking Ball super star for her courage regarding her appearance. She’s never afraid to toy around with male-oriented hairstyles, such as the front curl. Mix this greaser hairstyle with the right makeup and outfit and you’ll be dazzling. Contrary to what some women may believe, almost all pixie haircuts are cute and feminine. If you want a European vibe for yours, try getting shorter bangs. You’ll look and feel like a bohemian French girl ready to travel the world! Ever since she started experimenting with short hairstyles, Miley always tends to dye her locks platinum blonde. 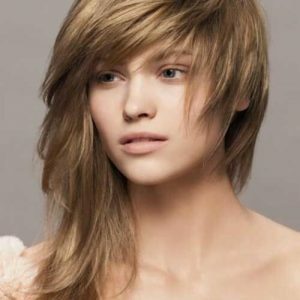 We believe that such a girly hair color provides perfect contrast when mixed with boyish hairstyles. The piecey haircut is to die for too. Whether or not your hair is naturally thick, you can add volume and definition with the help of well-cut layers. Even more so, if your hair is significantly long, short layers are just what you need to pump your locks up without resorting to shorter haircuts. Here is a razor pixie cut in full, feminine, fabulous glory. Despite the short length, the Miley Cyrus haircut in the photo above is truly classy, thanks to the styling. The secret is to fully sweep your hair to the side, lightly styling your bangs to not cover up your forehead. As an alternative, you can have fun with a tomboy look by getting a super short bob or pixie. What makes the look stand out is the front section, which features short and choppy bangs. It’s yet another European-inspired look to complement all sorts of women. The long, caramel hairstyle here looks so natural that it barely seems to be styled at all. In addition to the earth tone, the long locks are ever-so-lightly styled to only form a few waves in the front. It’s a must for bohemian girls. They say you only live once, so why not make the most of it with exciting hairstyles? Another look you can try out if you have a pixie cut or short bob is the small space buns hairstyle. Simply part your hair down the middle and wrap the two sections of hair in tiny buns on each side. Bangs can make or break your overall appearance. If you have the kind of facial features that bangs work with, you should never hesitate in wearing them. To come off as natural as possible, leave them a little longer and casually draped down your forehead. The words “Miley Cyrus” and “flashy” seemed to have been almost synonymous up until about a year ago. Notwithstanding, it’s all part of the Miley charm we’ve grown to love. 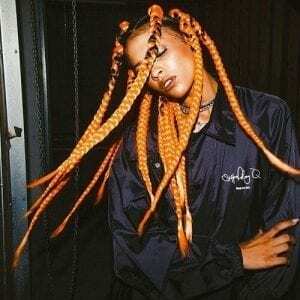 If you want to get an out-of-the-box Miley Cyrus haircut, the braided, colored and heavily styled one above is for you. In some cases, all you need is a pinch of color to take your hairstyle to the next level. A Miley Cyrus haircut with a long pixie, for example, can look brilliant with a few pale pink accents on top. It’s a terrific way to boost the girly side of your short haircut. Are you rather interested in a long Miley Cyrus hairstyle that you can wear at school or work? The casual, half up half down, pinned hairstyle is just what you require. It focuses on the comfortable aspect of a good hairstyle, as well as the easygoing aesthetics. So, let’s say you’ve worked up the courage to get a razor pixie cut with two tone hair like Miley’s. What can you do to make it even more edgy? 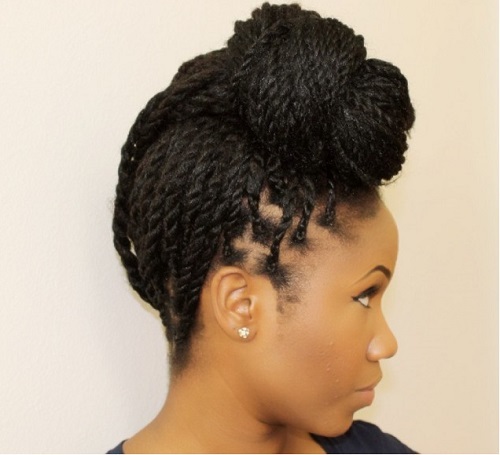 Add a braid or dreadlock to the mix! Take a section of your hair along the line that separates your undercut from the longer top andpixie braid away. 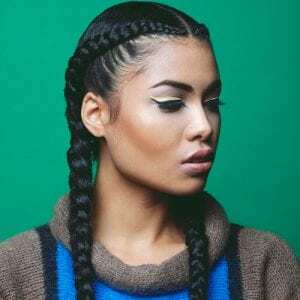 Whether you love fishtail, pull-through or boxer braids, you’re going to fall head over heels for this hairstyle. Loose, playfully braided pigtails with curtain bangs are perfect for girls with medium-length hair that want a boho hairstyle. Even the greatest of celebrities don’t stress about their looks all the time. You can follow in Miley’s footsteps with a pretty, messy bun for any setting. Like ponytails, careless buns are ideal for literally any type of context, from casual to formal. If you have a face structure that’s similar to Miley’s, you’re in for a treat with this haircut. The foundation is a stylish long bob, but what makes the look truly special is the inverted cutting. We recommend the technique as a gorgeous way to frame your face through your hairstyle. You have to use several “ingredients” to get a textured Miley Cyrus haircut like this one. Firstly, you’ll need short and heavily layered hair. Afterwards, you’ll require quite a bit of styling product to get the wet look. Mix these aspects together and you’ll have a dreamy, textured haircut you’ll love. We’ve seen tons of Miley Cyrus haircut photos with loose curls, but few come close to the glam that these extra large waves provide. Aside from the vintage vibe they give off, they’re also incredibly elegant and flattering for women with mid-length hair. Lastly, you can get back in touch with nature if you have a genuine boho hairstyle. The key piece to the look is the handmade flower crown, but the long, untamed locks matter just as much. You’ll also want to save this photo for festival hairstyle inspiration. In summary, there’s no doubt that you have at least one Miley Cyrus haircut that you can adapt to your personal style. We’re thankful that she has been a true chameleon throughout the years, considering that she now provides tons of versatile inspiration for us. But enough about her; what about you? What’s your favorite hairstyle from our list? Share your opinion with us in the comments!